Water shortage, which is rising globally, is one of the diverse reasons of hunger, war and refuge seeking. 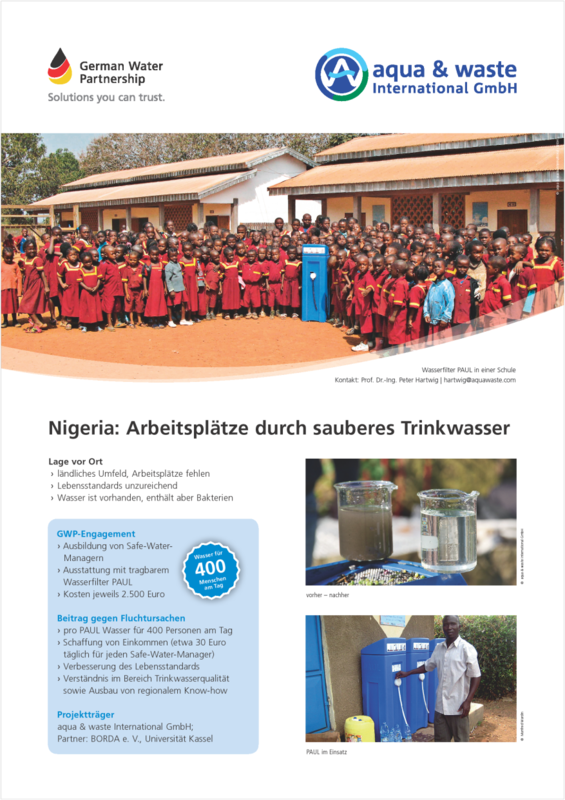 At the moment, German Water Partnership (GWP) is expanding its engagement in order to counteract this problem. The network, consisting of 350 companies and scientific institutions as members of German water-sector, presented a guideline with the title of „Fight against refugee crisis causes – German water management on site“ in GWP annual conference on 16th of May, 2017. „ We have to deal with water shortage in so many parts of the world in order to prevent the refugee crisis “, reported Gunda Röstel, CEO of the German Water Partnership. „Important activities are known and are already implemented by our members all around the world“. These activities include promising measures such as educating the water experts on site as well as creating sustainable technologies and business partnerships. „We are ready, now the politics needs to go on“, says Gunda Röstel. To realize a fast implementation, it is also important to establish new ways of financing in addition to the current development assistance. Therefore, it could be useful to realize regional oriented financing funds with a small administrative expense. With this concept, a transparent, efficient and fast access and control would be possible in all areas of operation. In the context of progressive climate change, the main focus has to be put on the early detection, prevention and capacity building. The suggestions were discussed with Thomas Silberhorn, who is the parliamentary secretary of the German federal ministry of economic cooperation and development (BMZ) as well as with Dr. Christoph Beier, deputy chairman of the board of the German Society for International Cooperation (GIZ) Ltd. at the GWP-conference. „The competition for using water has been leading to serious conflicts in arid countries and regions in the globe for centuries“, reminds secretary of state Thomas Silberhorn. „Investments in a better water resources management are direct prevention measures from conflicts which eventually will lead to a decrease of refugee seekers. In order to achieve this we want to and also need to integrate the private sector more than it is done at the moment“.